doxo bill paying service announces major milestone as it surpasses 2 million registered users nationwide. 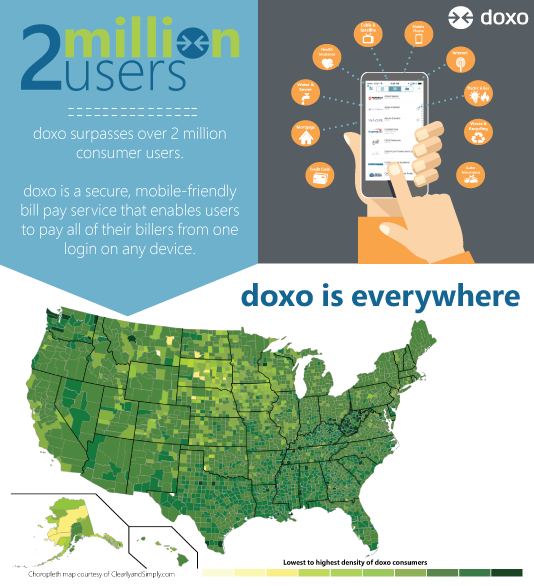 “Reaching 2 million users with such a high sustained growth rate is an indication of the need in the market for an all-in-one bill pay solution designed around the user," comments doxo CEO and Co-Founder Steve Shivers. doxo, the all-in-one bill paying service, has announced a major new milestone for the company, as it has now officially surpassed over 2 million registered users nationwide. The milestone is an important one for doxo and cements the company’s steady record of growth across all counties in the U.S. As the first crowd-sourced bill pay service, doxo’s growing user base continuously adds more of their billers to the doxo network—now totaling more than 43,000 unique billers across the country added to the doxo Provider Directory. With a user growth that has more than doubled in the past year, both the number of users and the size of the doxo Provider Directory will continue to expand rapidly. “Reaching 2 million users with such a high sustained growth rate is an indication of the need in the market for an all-in-one bill pay solution designed around the user," comments doxo CEO and Co-Founder Steve Shivers. "The average U.S. household has to pay over 12 bills per month, and paying those bills using a multitude of websites and methods can be a frustrating and time-consuming experience. Over half of the billers in the U.S. don’t even have payment capability on their websites, and far more don’t support payment with a mobile device at all. Customers are actively seeking a simple, secure way to pay all of their bills—on any device from a single account—and doxo provides this with the largest potential array of payment options. Additionally, our homogenous user base maps closely with U.S. population centers and shows the need for a better bill-pay solution across all U.S. geographies and demographics." doxo’s all-in-one bill pay service enables billers to uniquely benefit from a network effect that drives substantially higher customer engagement. The growing list of billers joining doxo’s network benefit from direct electronic payments, no-cost paperless and auto-pay adoption, and much higher customer engagement. In the same way that Facebook and LinkedIn broaden personal engagement, doxo enables billers to expand customer engagement dramatically by aligning with how their customers handle all their bill payments. Through this network effect, billers gain transparency and engagement levels that are impossible to achieve through their website alone. Billers can learn more about the benefits of joining doxo at http://www.doxo.com/business. Each new user on the doxo network adds even more billers, and new billers that join and connect with customers through doxo achieve consistently greater engagement. "Network effects generate exponential growth and bring user engagement to billers at unprecedented levels,” adds Shivers. "And at doxo, we’re just at the beginning of a very large growth curve, and expecting much more to come." doxo’s service also demonstrates the power of aggregate consumer data for understanding market leadership, spending and trends. doxo’s unique and proprietary market data provides consumers and billers with a unique new way to look at what people are spending money on when it comes to their monthly bills. With doxo, billers and consumers can view leading service providers and compare average bill pay amounts in every part of the country, broken down in detail for more than 35 leading biller categories. Such analytics reveal trends like the fact that the average bill payment in 2017 so far is $123. The top four payment categories on doxo are currently insurance (at an average of $234 per bill), credit cards (at $155 per bill), and phone/TV/Internet (at an average of $120 per bill), and utilities (at $116 per bill). Headquartered in Seattle, doxo (http://www.doxo.com) makes it simple for consumers to manage and pay their bills in one place. To date, doxo’s over 2 million users across the country have added more than 43,000 unique billers to the doxo biller directory, making doxo the first crowd-sourced, customer-centered payment solution for bills, which currently comprise more than half of U.S. household spending. Billers that join doxo are connecting to their customers, increasing mobile payments, boosting auto-pay enrollment, accessing vital real-time market data and more. Through doxo, large businesses like AT&T, Mountaineer Gas, National Grid, Puget Sound Energy, and Kansas City Light, as well as many other regional and local service providers in finance, utilities, healthcare, telecom, banking, insurance and other sectors, are getting paid faster. For more information on doxo for business, billers can visit http://www.doxo.com/business. Founded in 2008, doxo is backed by leading venture investors including Mohr Davidow Ventures, Sigma Partners, and Bezos Expeditions. For more information about doxo, please contact us at (206) 319-0097 extension 3, or press [at] doxo.com.